Stainless Steel Flat Bar is essentially a pre-manufactured strip of stainless steel. We stock these Stainless Steel Strips in a wide range of widths & thicknesses – starting at 20mm wide x 3mm thick up to 100mm wide x 12mm thick, and dozens of sizes in between. Larger sizes of Stainless Steel Flat Bar, and also cut pieces of Stainless Steel plate are available upon request – please contact us with your requirements, and we promise to get back to you promptly with a quotation. There are 2 types of Stainless Steel flat bar that we stock – Slit and Rolled Edge and Hot Rolled. The majority of Stainless Steel Flat Bar that we stock is slit & edge rolled. These bars are slit from stainless steel plate and then the edges are treated (rolled) to remove any sharp burrs. 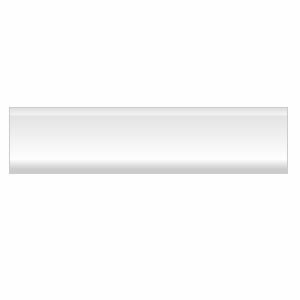 The slitting process can sometimes leave the finished bar with 2 faces (on the thickness dimension) that are not completely straight. Of course, if the bar is being machined to size this will not be a problem, but if not and the squareness of the section is important, you may be better off requesting hot rolled bar. It is worth noting that hot rolled stainless steel flat bars are only available in thicknesses of 10mm & over. All 3mm, 5mm, 6mm & 8mm thick strips will be slit & edge rolled. 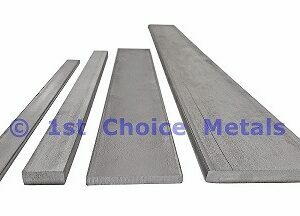 One of the big advantages of this type of Flat Bar is that it’s surface is suitable for polishing. These Stainless Steel Bars are hot rolled. This method of production leaves a neater, and completely square section. However, it is a more costly process than slit & edge rolling, and the surface finish is quite rough and therefore is not suitable for polishing. Regardless of which method of manufacture, these Stainless Steel flat bars are available in 2 grades – 304 & 316. Grade 304 is the most popular of all grades of stainless steel as it is an excellent multi purpose grade. It has excellent strength, hardness, weldability, good formability, it can be machined and has excellent resistance to corrosion. Should you require your stainless steel flat bar folding or welding then please contact us for a quote. Although more expensive, the one major benefit of using Grade 316, is it’s ability to withstand saltwater. For this reason, grade 316 is often referred to as the marine grade of stainless steel.